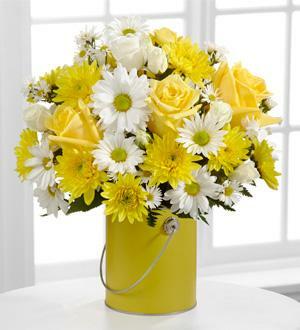 The Color Your Day With Sunshine™ Bouquet by FTD® is blooming with a bright cheer that will charm your special recipient at every turn. 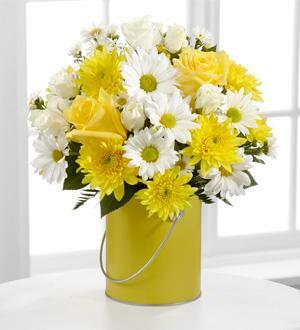 Yellow roses, white spray roses, yellow cushion poms, white traditional daisies, white monte casino asters, and lush greens are brilliant and bold arranged to perfection in a sunlit yellow quart size decorative paint can inspired vase to create a gift that conveys your warmest wishes. GOOD bouquet includes 10 stems. Approximately 12"H x 10"W.
BETTER bouquet includes 16 stems. 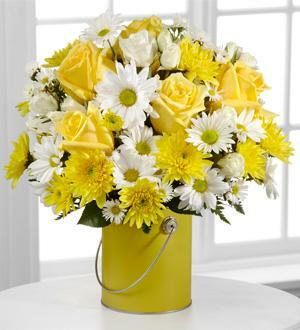 Approximately 13"H x 12"W.
BEST bouquet includes 21 stems. Approximately 13"H x 13"W.